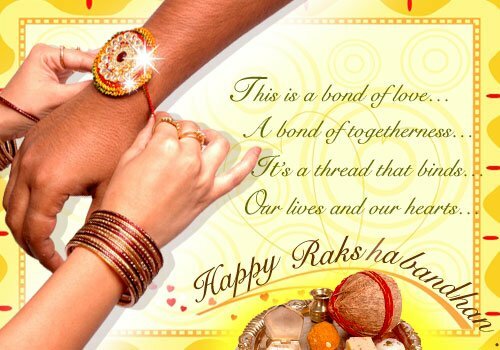 Raksha Bandhan or Rakhi is the day of brothers and sisters love where brother promises his beloved sister to protect her from every bad situation in her life and sister promises her brother to shower unkindly love and provide emotional support to her brother in his bad times.If you are searching for Raksha Bandhan wishes, messages and quotes. Now you don't need to search for them anymore. As here I have compiled down some of the best Raksha Bandhan wishes, messages and quotes. Just hope you will like the quote compilation and able to find some good words to say to your brother and sister. Hey my sweet little pie, your cute smile makes my day; you are little angel of my life. i love you. yours elder sister/brother. The principle is: competing against yourself.It`s about self-improvement,about being better than you were the day before. Happy Raksha Bandhan. This is a bond of love... A bond of togetherness... It's a thread that binds... Our lives and ourt hearts... Happy Rakshabandhan Bhaiya/Behna. Raksha Bandhan or Rakhi Wishes from Sister to Brother. Brothers are like street lights along the road, they don't make distance any shorter but they light up the path and make the walk worthwhile. Thanks for being my side, Bhaiya. Happy Rakhi To You. Hey didi you are the best.Do you know why? Because I am your brother. I want to tell you, times when we fought, my love was in different mood. Happy Raksha Bandhan. Rakhi is just an excuse for me to tel you that you mean the world to me. Happy Raksha Bandhan to my sweet Brother. Sisters is probably the most competitive relationship within the family,but once sisters are grown, it becomes the strongest relationship. Happy Raksha Bandhan Sis. Raksha Bandhan or Rakhi Wishes from Brother to Sister. I fought with you,i cried with you.you have always been my first and best friend. Happy Rakhi Didi/Sis. Having someone by your side who understands you in and out, takes care of you, is the first one you want to reach to whenever you. Happy Rakhi Sis. The warmth of your love is all i need during these cold times. Happy Raksha Bandhan Didi. Your love makes me feel proud. And on this day I want to shout it out loud. Happy Raksha Bandhan my sister.god bless you for ever.